As published in Philippine Daily Inquirer December 28, 2014. Additional photos from author Margaux Salcedo. . 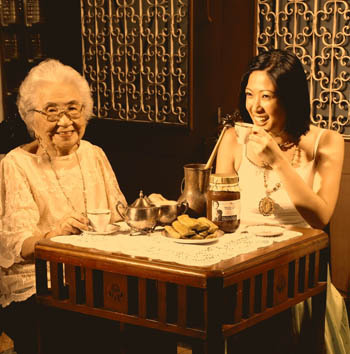 This coming 2015 may be the year when the Philippines will make it to the culinary world map. Tourism Secretary Mon Jimenez is bringing Madrid Fusion to Manila, with no less than Mugaritz Chef Andoni Luis Aduriz doing demos. At the same time, critically acclaimed restaurants are opening at the City of Dreams Manila. Executives will be happy to know that Nobu, the renowned dining destination of the stars created by actor Robert de Niro and Chef Nobu Matsuhisa, has already opened at the Nobu Hotel. But Nobu is not the only star in the City of Dreams. 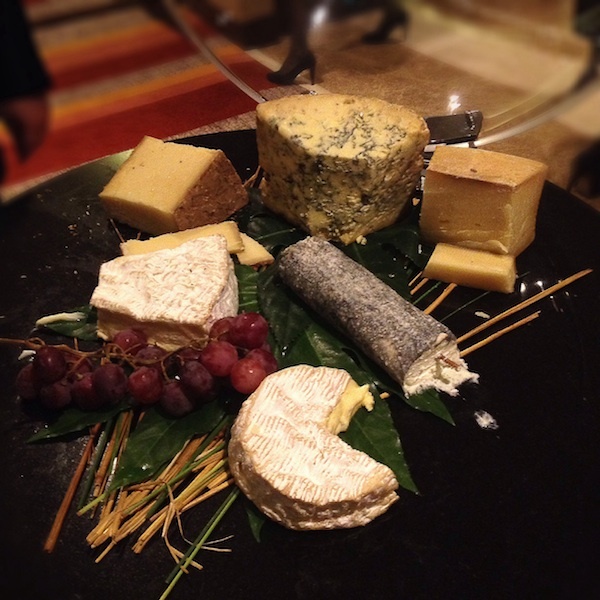 Tucked in the Crown Towers (another hotel at COD scheduled to open early next year) is a decadent French affair called The Tasting Room. 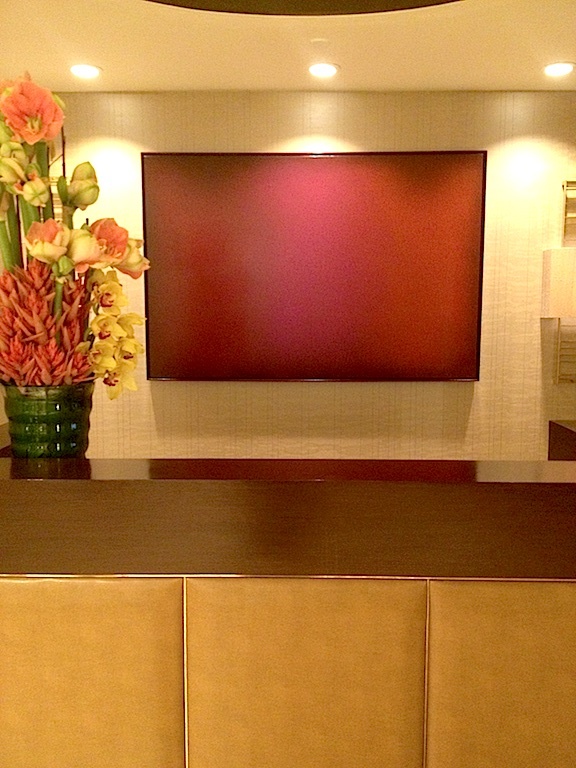 Upon entering, you might notice a splash of burgundy, an understated piece of art just behind the receptionist. It is a hint at what this restaurant has to offer: the best wines. However, more than a credit card, you may need a bank loan for some of the wines on its list! The bottle of 1982 Chateau Latour, for example, may be appreciated for P397,000. Is that too much? You might opt instead for the 1990 Chateau Lafite Rothschild at P243,000. But don’t be intimidated. The list is not limited to pocket-painful vintages and runs the gamut from incredible to approachable. It carries Clarendelle wines, a brand created by no less than Prince Robert of Luxembourg to respond to the challenge of creating a more accessible bottle of Chateau Haut-Brion. You may also order by the glass, at an average of P500 to P800 per glass, for a complete experience of a wine-pairing dinner. Gigi Varua, Assistant Restaurant Manager, is a US-trained sommelier, and can guide you very well. With a wine list like this, you will need a menu that can rise to the occasion. Basque chef William Mahi has created just that. Chef William Mahi gamely posed with me and Goldee Salcedo, my very expensive date. 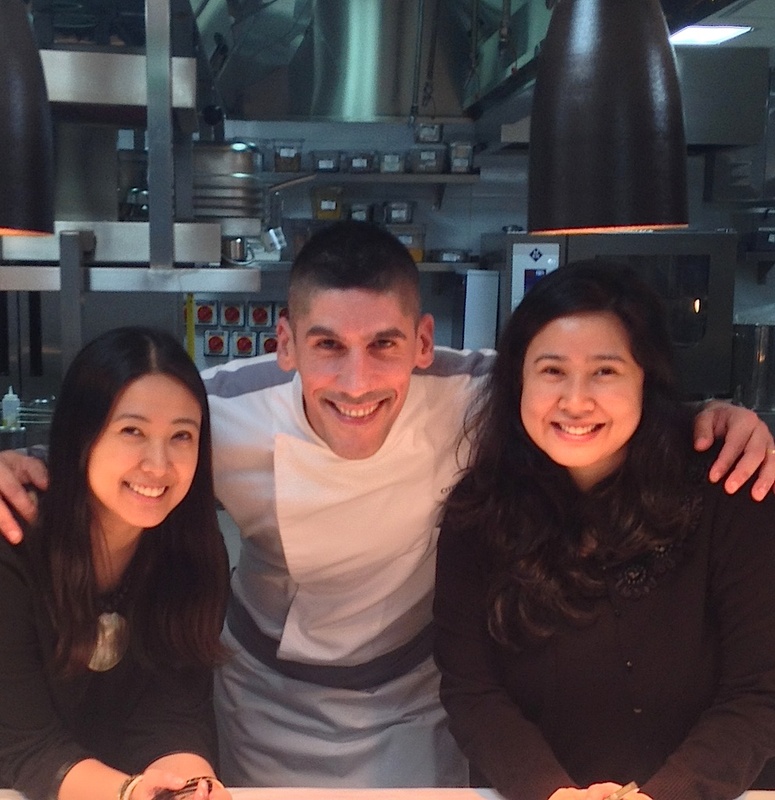 Mahi arrived four months ago from Shanghai, where he was Chef de Cuisine at Papillon at Lan Club at the Bund. Before that, he was at two-Michelin starred Spondi in Athens. 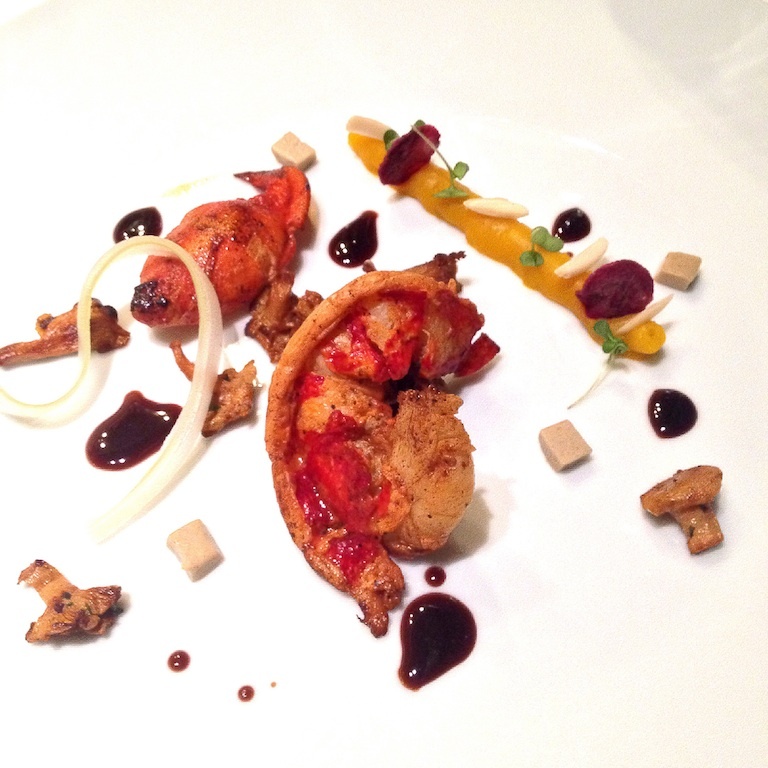 But he has also worked in the kitchen of Joel Robuchon as well as at the renowned Plaza Athenee of Alain Ducasse. It seems, though, that he has always had the gift for flavor as a quick Internet search will reveal that at the young age of 14, he apprenticed at Table des Fréres Ibarboure and just two years later, he was given the honor of being recognized as Best Apprentice in France. Blessed with a kitchen customized to his preferences at Tasting Room, the chef does not hold back. Truth be told, the menu is at that level that if you order the lesser wines, it may outshine the vino. Nevertheless, you can also have the menu with just still water and still be blown away by the food. 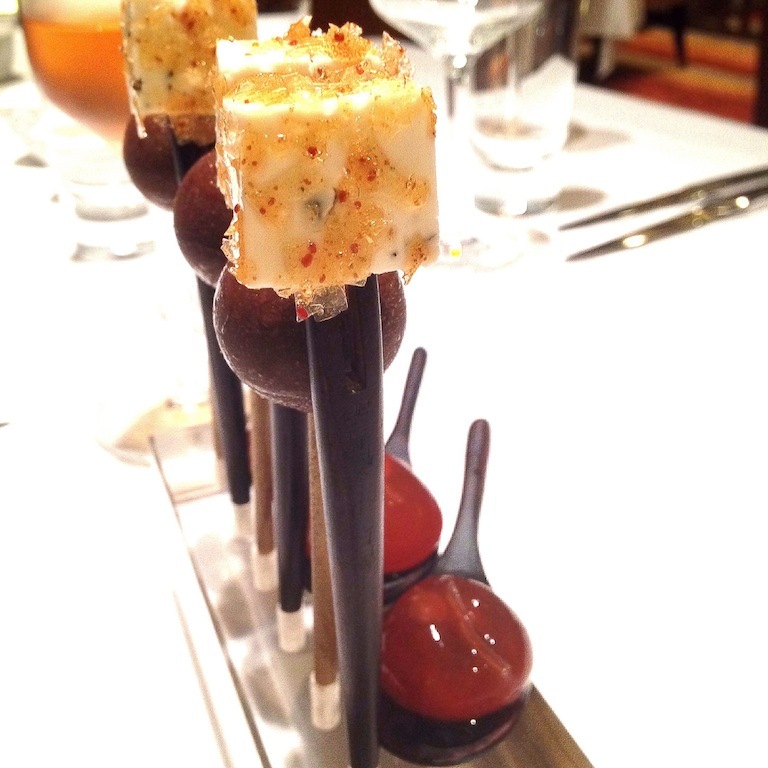 Chef Mahi makes an entrance with his amuse bouche, a trio that instantly tells you what he is capable of. Goat cheese is ornamented with tiny sheets of caramelized syrup that contain pork. Pork? I asked in disbelief. The chef, a bit more relaxed on my second visit, shared that it goes through a process where the pork is flattened then put in a machine that converts it to powder form, which is then sprinkled on the caramelized syrup before it becomes this delicate sweet glass that dresses the goat cheese. The chef apparently dabbles in molecular gastronomy. After he captures you with the cheese, the hello is given a crescendo with foie gras. But this is no ordinary foie gras starter. It’s a dollop of liver captured in chocolate, presented as a lollipop to remind you of the happiness of your childhood. It is pure bliss. The menu is divided into several sections: Beginnings or the starters section; Rare and Unique for slightly unusual items like pigeon; Organic and Sustainable for items like organic pork; Contemporary; Aqua for seafood; Tierra for beef, including duck and lamb; then there is dessert and cheese. You can choose to order a five-course dinner, which the restaurant teases as Damien’s Delight. Or indulge in six, seven or eight courses. But a five-course menu is enough. By the fourth course, you may be full. You also don’t have to order by section. You can grab all five courses from just two sections, e.g. Beginnings and Organic, if you wish. The restaurant is in fact quite generous with truffles. I was delightfully surprised on my second visit to find that the Mushroom Ravioli is also laden with this most precious ingredient. It is pure indulgence. For a second course, try the Duck Liver Terrine. 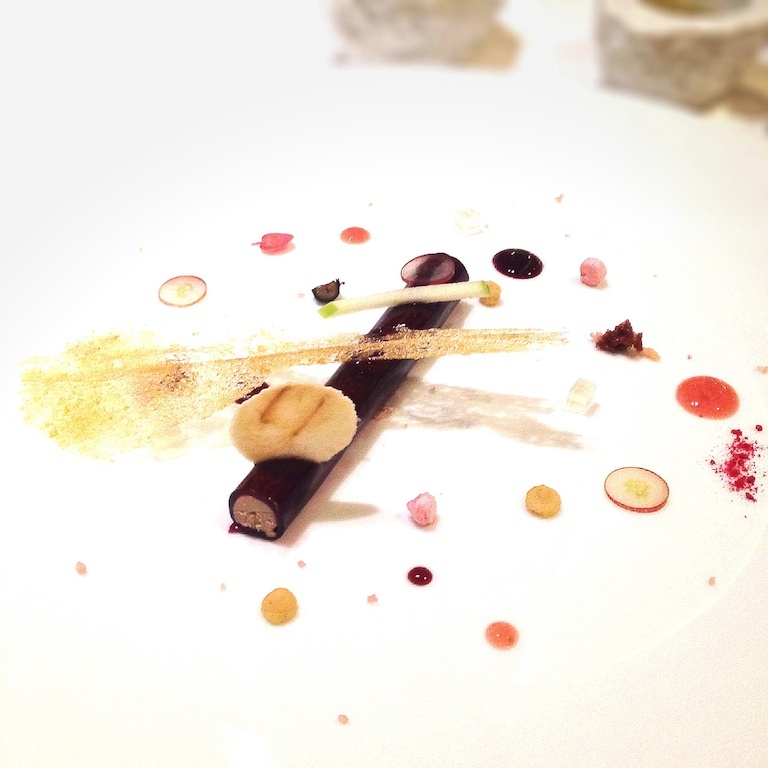 First for the sheer value of the foie gras but more importantly for the chef’s art. Foie gras is just foie gras, I thought. Wrong. At Tasting Room, Mahi wraps the liver in a thin roll that looks like chocolate but is in fact wine jelly! And then, understanding that the guest may nevertheless get tired of the taste too soon, he accents the plate with port wine reduction, a dot of strawberry sauce, a pinch of raspberry powder, plus lychee jelly and an apple-and-honey crisp. It’s magical! Continuing on the theme of amazing, the chef puts the same effort into a dish of salmon. This is no ordinary salmon-and-capers dish. 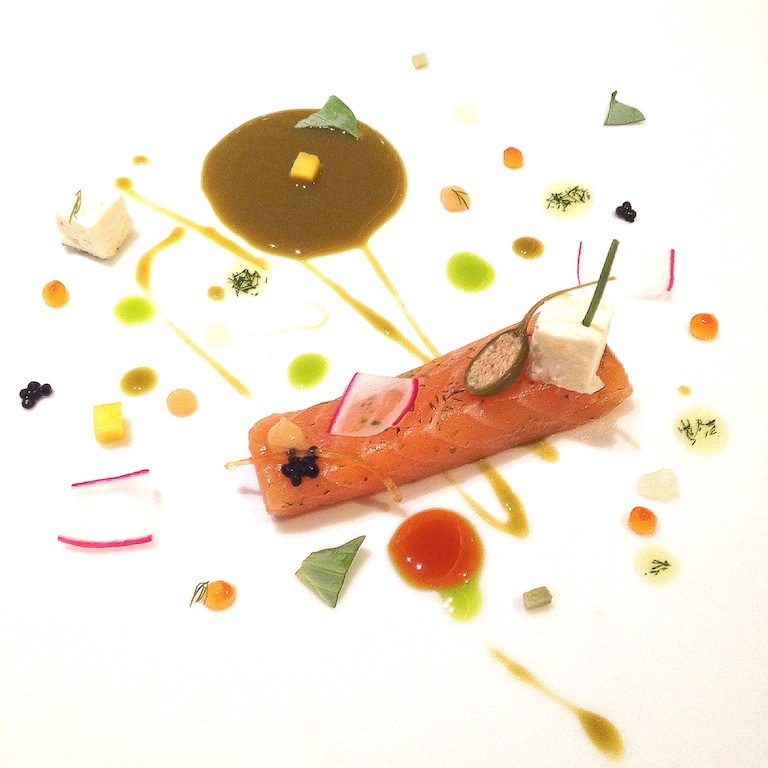 Salmon is marinated for 36 hours before being served accented with salmon and herring roe. To take you from city to the sea, the chef creates a sauce from fish stock and a selection of green herbs that is bursting with umami. You will also have fun starting off the course by nibbling on a little oyster leaf, which will puzzle you: how does this leaf taste like an oyster?! For your main course, try the Barbarie Duck (served medium rare). The chef playfully puts curried popcorn on top. This dish shows the playful side of the chef, who explained with a wink that he put popcorn because ducks eat corn; and the side of filo pastry has smoked eggplant polenta to maintain the theme of the happy duck. 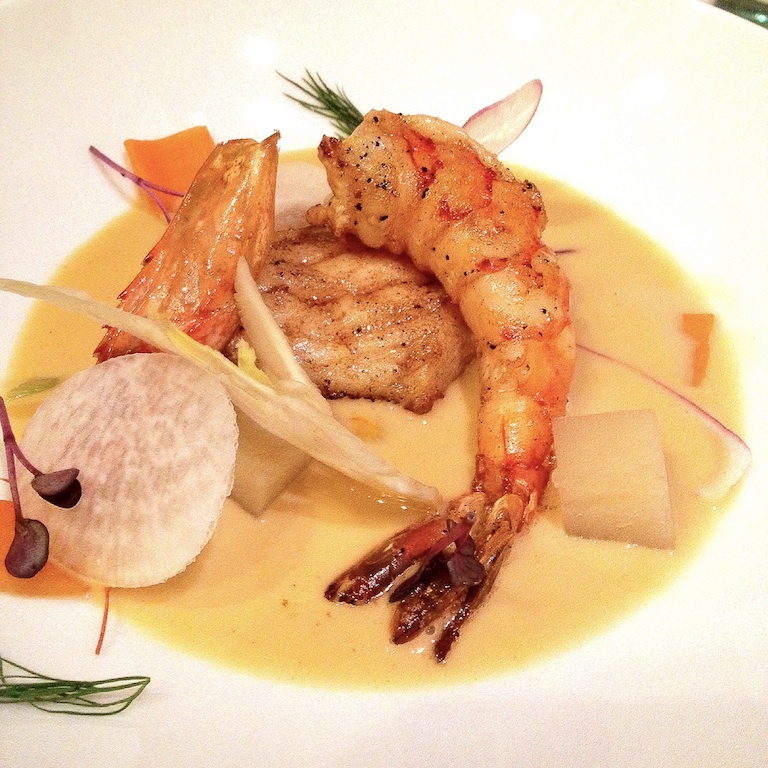 It is not only the chef’s skillful execution of creative concepts that distinguishes this restaurant. The quality of the ingredients used is remarkable as well. The lobster is Brittany lobster. The pigeon is a free farm range pigeon from France. The pork belly comes from an organically grown French piggy. And the beef for the steak is a 21-day dry aged Wagyu. Take the pigeon. So thick, you will feel like the Prime Minister being served in The Hundred Foot Journey (a must-watch film for every foodie). This is appreciated with a side of pigeon liver cannelloni. A truly decadent main course that might be overwhelming for more conservative eaters. Then there is the pork belly, which is likewise a thick slab. The chef pairs this with pork trotters, flattened to become like a chicharon chip but using the sticky gelatin from the pig’s pettitoes. Tell your CEO to bring his Lipitor. Best of all is the steak. There are few restaurants in the country that have succeeded in offering dry-aged steak. But I have confidence that this one is here to stay. It is a very beautifully executed blue steak: charred on the outside, beautifully soft on the inside. A must-order for your five courses. Upstaged, because of the wow factor of the dishes earlier mentioned, is the Marseilles bouillabaisse, which must be credited for its tasty 72-hour slow-cooked broth. It is also easy to overlook the San Sebastian calamari, where the head is cooked tempura-style. Or the Atlantic crab wrapped in turnip instead of a filo pastry. But this only highlights the fact that while the hotel has yet to open, Chef Mahi already has an extensive menu that is ready for the discerning palates of Manila’s best executives. You may not have room for dessert. But if you do—and if you can take the alcohol—make space for the Absinthe Cold Espuma: dices of Fuji apples drowned in Absinthe. At this point, you will have to let go of that glass of red. But it perfectly caps a wicked meal. While this is the City of Dreams, remember: dreams here do come at a price. Try not to fall off your seat when you get your bill! Remember that each bottle of Aqua Panna poured for you is being charged. And when the waitress says, “I will make you try so-and-so wine” and it is poured, that glass is not necessarily on the house “to try” but may be billed as well. Then charge it to experience—a good one, anyway. 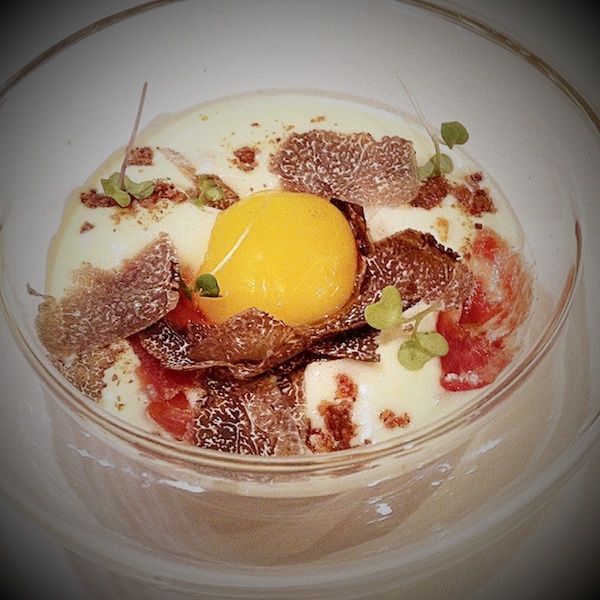 The 52-degree egg, with the Perigord truffles, could well have been a dish at 8½ Otto e Mezzo Bombana in Hong Kong whose Chef Umberto Bombana was voted in the Miele Guide by Asia’s top chefs as the “Chef of Chefs.” The duck terrine can compete with the starters at the Four Season’s Caprice. 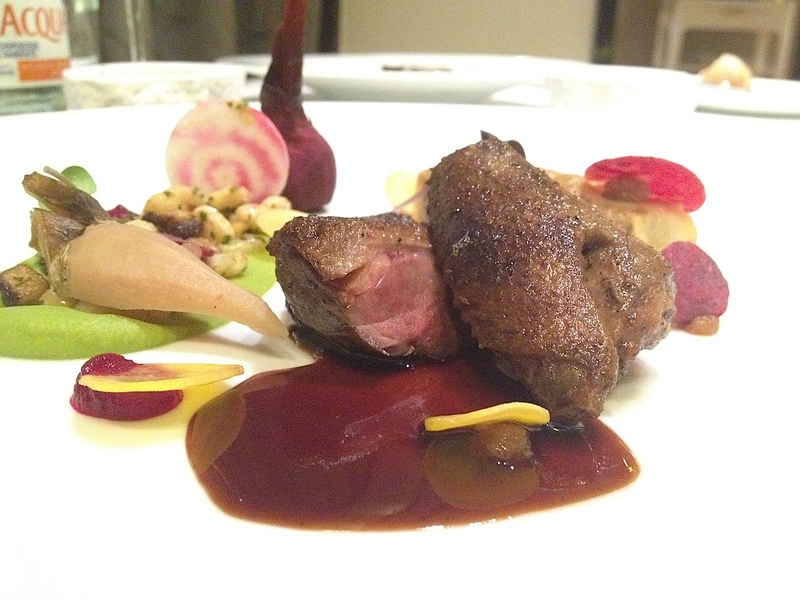 And the pigeon is something you might order at Plaza Athenee in Paris. Mahi has just upped the game in the Manila dining scene. He is the crown jewel of Crown Towers. If he continues to bring his A-game, alongside Nobu, the City of Dreams will undoubtedly be the dining destination for 2015. Reservations recommended. Tel. 8008080. Open for dinner only from 6 to 11 p.m.
Degustation Menu is presently priced at P3,200 for 5 courses; P3,600 for 6 courses; P4,200 for 7 courses; and P4,500 for 8 courses. Parking and Valet not yet available at Crown Towers but available at the main casino/retail building, then they offer a buggy ride to the Crown Towers lobby. Photos c. Margaux Salcedo 2014.